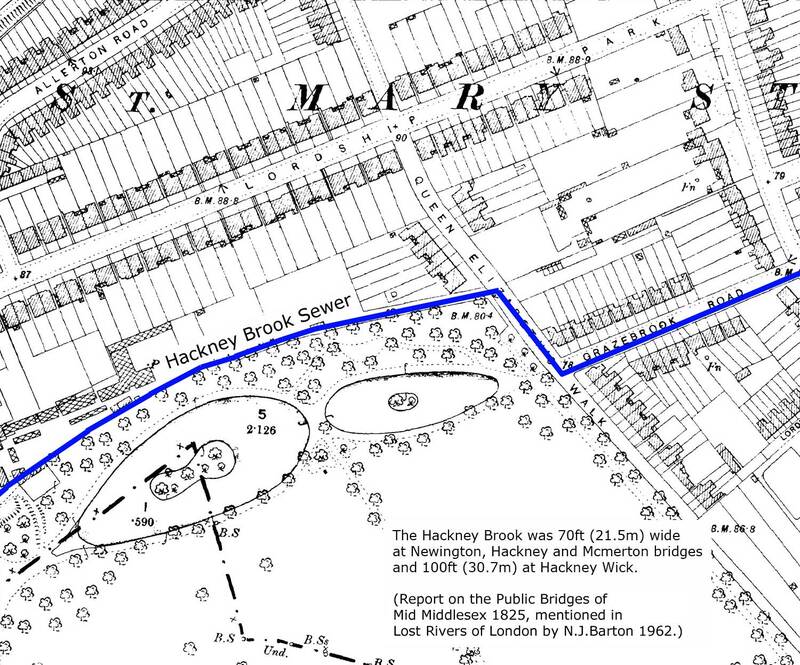 The 1894-6 Ordnance Survey shows that the Hackney Brook had been incorporated into the Hackney Sewer. This would have carried off most of the flow, but the springs and tributaries which fed it after Clissold Park, still continue to flow. These fill the Fish Ponds in the Park and, no doubt, provide ornamental water and wet cellars all the way to Old Ford. Stoke Newington High Street is an old Roman road. It runs on gravel and Brickearth all the way from Shoreditch to Stamford Hill, except where it crosses the narrow belt of clay at the junctions with Cazenove and Northwold Roads. King James VI of Scotland found this out on his triumphal progress from Scotland to London. He was coming to be crowned King James I of England, Scotland and Wales. Berwick, which had been fortified against the Scots for centuries, opened her gates. So did other cities. Everyone made his passage easy except Stoke Newington. Here, the villagers who turned out to see him had plenty of time to study his face, for instead of hurrying past, he had to skirt a wide, muddy lake just there. The Hackney Brook held out to the last by flooding his path and giving a prophetic slant on a minute scale to the Stuart toast to 'The King over the water'. The public house on the site was named 'The Three Crowns', but whether in loyalty or insolence, nobody knows. Today the Hackney Brook is underground and provides water for the Hackney Sewer, but the memory of the open river lingered on. Until a few years ago there was a 'Riverside Shoe Shop' in the High Street. Rivers and their tributaries are hard to destroy completely as houses built in their old beds can still remind us. During the 19th century, Stoke Newington became larger but it stayed on the gravels and Brickearth south of Stoke Newington Church Street. Only in the 1860s, when the Gravel areas areas were fully developed and there were no other spaces readily available, did the builders venture northwards onto the treacherous Clay.